Last week, Air Force Lt. Col. Victor Fehrenbach filed a high-profile lawsuit arguing that the Air Force should be forced to meet the "Witt standard" if it attempts to discharge him from military service under Don't Ask, Don't Tell (DADT). The "Witt standard" comes from a significant 9th Circuit Court of Appeals decision in an ACLU of Washington case, Witt v. U.S. Air Force, in which the court ruled that the Air Force must prove that dismissing a specific servicemember under DADT is necessary to ensure “good order, morale, and discipline” within the unit he or she served, rather than simply proving in a more general way that DADT broadly advances military readiness. With that requirement of proof, the “Witt standard” was born. We filed this lawsuit back in 2006 on behalf of Maj. Margaret Witt, who was discharged from the U.S. Air Force on the grounds that she engaged in homosexual conduct. Maj. Witt is a much-decorated flight nurse and operating room nurse assigned to McChord Air Force Base near Tacoma. In 1993, she was selected to be the “poster child” for the Air Force Nurse Corps recruitment flyer. In 2003, she was awarded an Air Force Commendation Medal for saving the life of a Defense Department employee who had collapsed aboard a flight from Bahrain. The lawsuit sought to reverse the decision to discharge Maj. Witt. The military provided no evidence that her sexual orientation had caused a problem in the performance of her military duties. The district court initially dismissed the suit. We appealed the case to the U.S. Court of Appeals for the 9th Circuit. 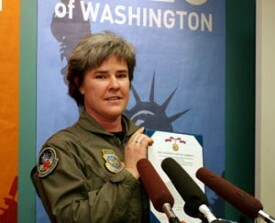 In 2008, the 9th Circuit ruled that in order to pass constitutional muster, the Air Force must prove discharging Maj. Witt is necessary for purposes of military readiness within her unit. While the 9th Circuit's decision did not overrule DADT, it made clear that the military must make this individualized determination before it can discharge LGBT service members. In the meantime, Maj. Witt's case will be back before the U.S. District Court for Western Washington for trial, scheduled for September 13. The ACLU will prove that it was Major Witt’s dismissal – not her presence in her unit – that was bad for morale.